Kathy Green surprises ER staff at Royal Jubilee Hospital in Victoria with a treat during the 25th BC Transplant Operation Popcorn Wednesday morning. Dec. 9, 2016 5:00 a.m.
Moving from department to department at Royal Jubilee Hospital, a team from BC Transplant delivers smiles in the form of popcorn. BC Transplant’s annual Operation Popcorn, in its 25th year, sees transplant recipients and others visit intensive care units, emergency departments and operating rooms delivering treats to say thank you. Green led the team Wednesday morning. Joining her were her husband Rob in support, liver recipient Stephen Farmer, Heather Simpson, who awaits a double lung transplant and her support Erika Kanczula. “There are very few ways to give back, so any way I can make people feel valued and appreciated, I go for,” Green said. She spent two weeks in the intensive care unit and a month in hospital and endured some complications after her double lung transplant and was awed by the skills and compassion of staff. “I’ve had the opportunity to meet many other recipients and they feel the same way,” she said. 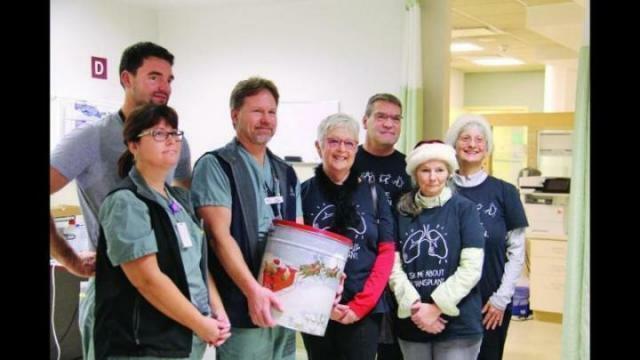 More than 100 volunteers, including recipients, living donors and donor families, will visit 31 hospitals in the province plus one in the Yukon, delivering more than 100 tins during BC Transplant Operation Popcorn. “As many as 150 healthcare workers can be involved in the donation and transplant process, and some never learn the outcome of their efforts, much less get an opportunity to meet the people they helped,” said Dr. Sean Keenan, medical director for organ donation at BC Transplant.